Home » Are Solar Panels Waterproof? Can My Solar Panels Resist Rainwater? Maybe you are thinking about installing a PV system, but you’re unsure if the solar panels will be able to work in outdoor conditions without getting damaged. After all, if the rain, storms, or even hail are common in your location, then it makes total sense to ask yourself if your solar panels will be waterproof. Since solar panels need to be placed outdoors to capture sunlight and transform it into electricity, they need to be designed to endure and resist multiple harsh environmental conditions. Solar panel manufacturers must submit their modules to lab tests that will ensure the performance of these devices under severe outdoor conditions. Tests include thermal cycling, humidity freeze tests, damp heat, hail tests, mechanical load tests, leakage current tests and more. Since raining is a natural phenomenon that occurs everywhere, solar panel manufacturers design their modules to be waterproof and to keep producing electricity after water falls on the module. Actually, a common maintenance practice is to set the minimum angle of the solar panels at no less than 15° in order for rainwater to do the cleaning of the modules. However, make no mistake, solar panels are still electronic devices that could get damaged if water enters into the module. 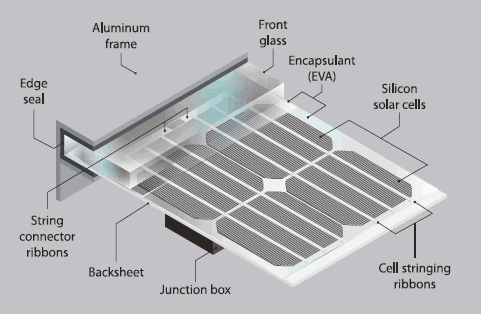 The only reason why rainwater does not affect the performance of the solar panel is because the wiring and solar cells are protected by a set of components: glass, sealing glue, an aluminum frame, a backsheet made from polymer-based materials, and an encapsulant made of ethyl vinyl acetate (EVA) which is used to provide adhesion between the solar cells, the top and the rear surface of the PV module. The figure below can better illustrate the structure and components of the solar panel. All of these components protect the solar cells and wiring from getting wet, which allows us to practice maintenance procedures using wet sponges or even low-pressure water to clean the modules. Without these seals, the cells would be exposed to the weather conditions and probably would not work anymore. In the odd and strange case that your solar panel’s seal is broken and water does enter into the module (resulting in damage), you must not worry because most manufacturers product warranties cover that. Nevertheless, rainwater can become a problem when is mixed with dirt on the surface of the module. Generally, when rain falls, the glass of the module gets clean, but the corners and borders of the frame could accumulate mud. 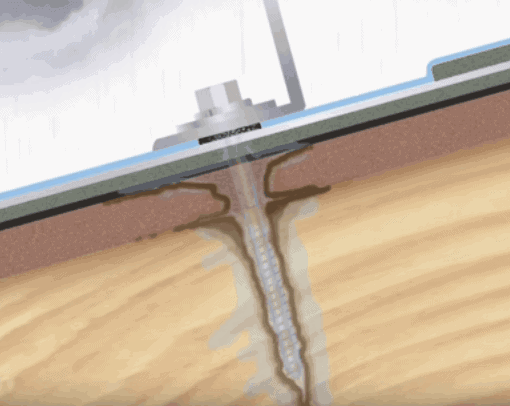 This is undesirable because it can lead to the presence of moisture and therefore increase the probabilities of leakage currents and a reduction in performance. Top and new solar panel models take this into account and avoid the presence of corners or borders where mud could get accumulated. 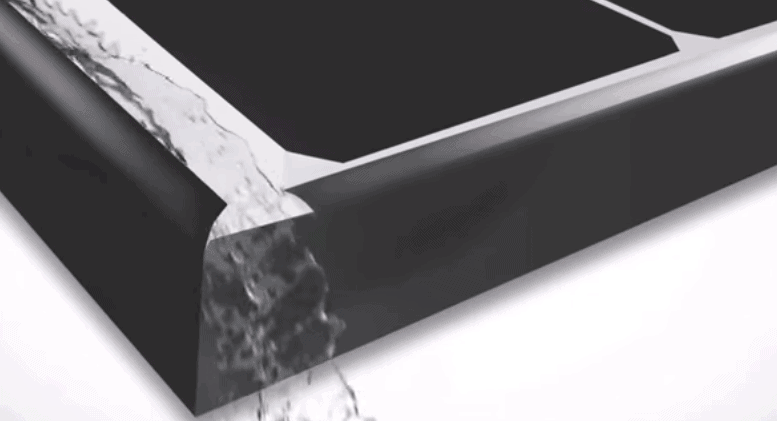 Water drainage systems like the HIT modules from Panasonic allow water to flow continuously through the surface of the solar panel, avoiding the accumulation of water in corners or borders. It seems like solar panels are protected against water, however, there is someone else in your PV system that needs protection from rainwater, your roof. In a rooftop PV array, the mounting system requires to penetrate the surface of the roof and the flashings (aluminum supports of the rails) need to be installed over rafters or trusses that will effectively resist the weight of the mounting system and the solar panels. Once the perforation is done, many solar installers include waterproofing sealants (applied under the flashing, around the bolt hole) in their installations to avoid any possible water leakages. Despite the fact that this is common practice, it has been verified that after 10-15 years these sealants could get broken due to the excess of solar radiation, contraction, and expansion of the material. This is due to changes in temperature, and it’s even due to oxidation. Therefore, the sealant by itself has short-term reliability. Once the seal is broken, rainwater can flow through small leaks, leading in time to rotten rafters and sheathing. This will translate into a costly removal and remounting of the PV array, along with the probability of adding a new roof (between $500 and $1000 ). Remounting your PV system could cost you around 50 c/watt, which if you think about a typical 4kW, could be around $2,000. As you can see, this is something that you do not want to happen. This is the reason why it is advisable to use code-complying flashing methods like asphaltic roofing cement with reinforcing mesh, or single-ply membranes like PVC, EPDM, and TPO to install the mounting system on the roof. Quick Mount PV, a roof mounting system manufacturer, focused on solving this problem by installing an aluminum flute to the top of the bolt hole, elevating the waterproofing sealant above the flood line and protecting it with a stainless fused aluminum instead of rubber. For more details, you can check this video. Since your PV system should be working at least over the 25-year period, then your roof should be strong enough as to resist that extra weight from solar panels over the entire period. Based on this approach, the best recommendation that a good solar installer should give you is to replace/upgrade your roof (or at least the section where the PV array would be installed) if it is older than 10 years. As you can see, there is more to say about waterproofing your roof than the solar panels themselves. Solar panels are designed to be waterproof and it’s very rare that they fail due to water leakages. However, a bad rooftop installation can lead to important damage in the support of the PV array, putting your investment in danger.